My absence from this blog hasn’t been intentional, as I have been working on a draft of my dissertation proposal. After some major concentration I managed to complete a draft that outlines my major arguments and intentions for what will surely become a mammoth project. As some of you already know, I began this blog to work out some of the major ideas of my thesis in an open forum, in hopes of getting feedback from loyal readers and — more realistically — providing me with an opportunity to fine tune the hypotheses and concepts that will eventually form some of my research. This blog is also an outlet for my own impressions, ideas, and opinions on cinematic trends, theory, style, and other quirky elements of Hollywood filmmaking. My research addresses changes in American sound practices since 1970, so that means I’m fascinated with the emergence of “surround sound,” THX certification, and the dynamics of film sound since the arrival of Dolby. Much of my interest stems from the importance of sound effects, Foley, and ambiences in contemporary films. Whereas the classical era of studio filmmaking relied mostly on dialogue and music (and some effects) to create a soundscape, films today boast aggressive, hyper-realistic, and complex mixes that foreground detailed effects. In addition to voice and music (source and score), mixes today are often more frenzied than the visuals. With faster cutting rates and computer generated enhancements, the image is often the focus of studies of changes in film style and technology, but my whole argument is that we need to consider how the sound of movies have changed as well. Perhaps the sound of modern movies has influenced contemporary visual style. One of my favorite websites is Film Sound Daily, which is a wonderful resource for interviews with sound professionals and information on the sound designs of new releases. Where else can you read informative interviews with Foley artists and re-recording mixers? Well, aside from Mix Magazine and filmsound. org, of course. 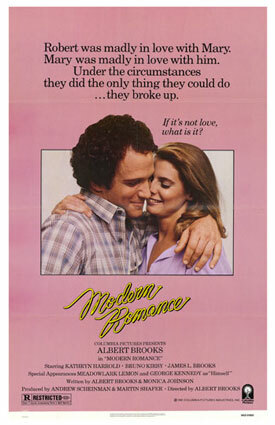 A recent post triggered my memory and nostalgia for the films of Albert Brooks, especially his early works like Modern Romance and Lost in America, which are two American comedy classics. Brooks has made a career of directing himself in small films that are never perfect, but always disarmingly funny. While Judd Apatow remains the current benchmark for relationship comedies, I prefer the dry and sardonic qualities of Brooks’ humor. Brooks proves that you don’t have to be a goofy man-child to be funny and endearing. The Film Sound Daily editors posted a short clip from a scene in Modern Romance, where Albert’s character, Robert, a film editor, tries to find the right sound effect for a scene he is working on. It’s a great moment that perfectly captures my interest in the power of sound to shape our understanding of a film. Over 90% of what we hear in films is created in post-production. On some films that number is even higher if production tracks are unusable due to environmental noise or recording errors. Everything from rain drops to the rustle of clothing is designed, edited, and mixed by some very talented artists, whose job is to convince us that the sound is tied to the image. In this way, sound effects can provide subtle or overt commentary, add weight to visual objects, or scare you with an unexpected stinger that stems from the rear of the theater. If I could open my dissertation with a film clip, this one would be an apt choice. I came across it as I was just finishing my proposal and thought I’d share it. It might surprise some to read that I — born well into the New Hollywood and the breakdown of the classic studio system — grew up admiring the actor and his many films. It must have begun when my parents planted me in front of our then giant 36″ inch television to watch Cecil B. DeMille’s The Ten Commandments in its entirety. 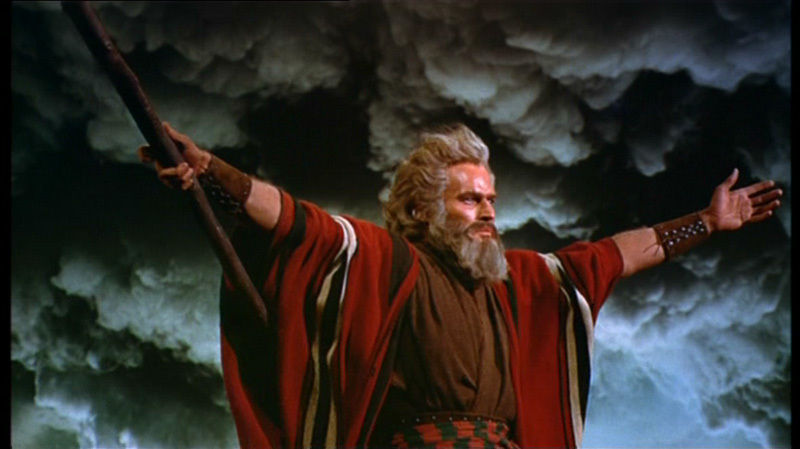 Heston’s portrayal of Moses, from young prince to learned leader of the Israelites, was anything but static or “marble-monumental,” which were criticisms levied at the actor throughout his career. How could a young Jew, like myself, not be captivated by the force of his booming voice calling for the Pharaoh to “let my people go”? Years later I watched William Wyler’s version of Ben-Hur for the first time and realized what presence he held on screen. David Bordwell has written an essay about the potency of actor’s eyes, and I submit that Heston’s were some of the most expressive in the studio era. There aren’t many close-ups in Ben-Hur, but when Wyler’s camera moved in tight on an actor’s face, it was usually Heston’s that captured the emotion of the scene. The intensity of the chariot race is there to see on his face, in his determined grimace that expresses a unique blend of confidence and vulnerability. Berkvist is right when he says that Heston was never upstaged, not even by a crowd of thousands or a set larger than a baseball field. When Judah finally collapses at the end of the film in the arms of his mother and sister, the weight of losing his family has been lifted, and it’s all there on screen, in Heston’s eyes and on his face. The role of Judah Ben-Hur won him his only Oscar. The film basically positions his character, Commander George Taylor, as the embodiment of the establishment who opens his mind when he sees the brutality and callousness of the ape race. In this way, Heston was very much at the border of this moment in film heroism. He was too tall, too masculine to embody the anti-hero status bestowed upon other contemporaries like Donald Sutherland and Dustin Hoffman. But beneath that surface was just such an anti-hero persona. For further proof of this, check out Major Dundee. In The Omega Man (1970) and then Soylent Green (1973), Heston continued to portray morally conflicted characters facing a global social crisis. His characters in all three of these science-fiction films were sensitive souls with an inner individualism that sought justice for those who had been wronged. This is the probably the one quality that set Heston apart from most of his peers. He was capable of playing a damaged hero with the deck stacked against him. He didn’t need to act the part of a leading man; that part seemed to come naturally. The vulnerable nature of many of his characters — from Moses to Detective Robert Thorn in Soylent Green — represented his real talent as a leading man. Nowhere was this vulnerability more evident and callously paraded as in Michael Moore’s Bowling for Columbine. Though I hasten to level any criticism at Moore or his crew, I will never forget the way in which Moore manipulated and cajoled an obviously ailing Heston to make a dubious point about gun control. 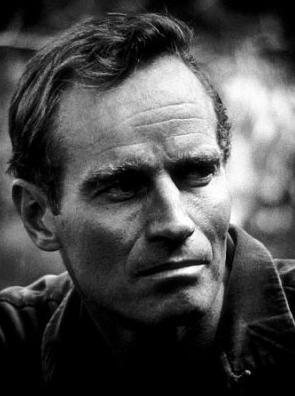 Though he is now more famous for uttering some of greatest one-liners in Hollywood history, Charlton Heston was a cinema giant. He parted the Red Sea. What more can you ask for?